The polycarbonate housings are extremely durable. They are impervious to chemical solutions normally used in a clinical setting preventing clouding and spidering. The polycarbonate flow tubes ensure durability. 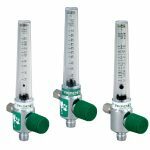 Our flowmeters use black glass flow indicator balls. Their exceptional sphericity and uniform weight contribute to a more accurate flowmeter than those using plastic floats. Highly accurate needle valves ensure precise flow-settings the first time…every time. 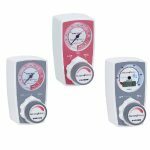 The flow control knob is on the front of the flowmeter in clear sight of the operator unlike side mount knobs which are susceptible to damage during installation of additional equipment. Our black glass float makes the flow setting easy to read. The housings and flow tubes carry a lifetime warranty and the needle valves carry a five-year warranty. The case is made of strong plastic. It features a smooth surface with rounded corners making cleaning easy. The case also houses the gauge for extra protection.